Depression is a mood disorder characterized by at least two weeks of low energy, listlessness, a loss of interest in previously enjoyed activities, and even physical pain. The second-most common mental disorder in the United States behind anxiety, depression affects 16.2 million people. The disorder affect all areas of a person’s life, disrupting appetite, sleep patterns, relationships and work, leading to physical and emotional stress. Also called dysthymia, persistent depressive disorder mirrors major depressive disorder. Sufferers experience low energy, lack of interest in once-enjoyed activities, and a general “down” demeanor. However, instead of weeks or months, symptoms endure for years. The chronic nature of persistent depressive disorder can make individuals more susceptible to drug addictions as they seek to self-medicate. A type of cyclic depression that occurs at the same time every year, seasonal affective disorder affects between 4 and 6 percent of Americans. Although most people experience it in the fall and winter, smaller numbers experience “summer depression.” Scientists still aren’t sure what causes SAD, but many point to a drop in serotonin and melanin levels as sunlight is reduced. Affecting 20% of people with major depressive disorder, psychotic depression causes hallucinations, delusions and paranoia. People with this disorder may hear voices or believe that others want to harm them. They may become angry for no reason or deeply isolated. Psychotic depression typically requires medication to treat and indeed leaves untreated clients particularly vulnerable to drug addiction. Peripartum, or postpartum, depression affects women in the weeks following childbirth. Characterized by mood swings, irritability, trouble concentrating and fatigue, the disorder mirrors the symptoms of major depressive disorder. About 1 in 7 women report suffering from postpartum depression, according to the American Psychological Association. A severe form of pre-menstrual syndrome (PMS), premenstrual dysmorphic disorder (PMDD) affects women at the start of their periods. 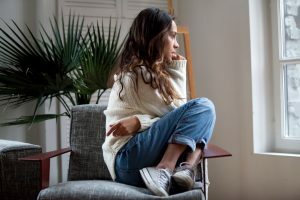 Women who suffer from PMDD experience the symptoms of major depressive disorder and many symptoms related to postpartum depression, including mood swings, irritability, fatigue and trouble concentrating. Although more than 90% of women will experience symptoms of PMS, PMDD affects fewer than 5% of women of childbearing age. Many women with PMDD also suffer from anxiety or other depressive disorders. Relationship Stress. Divorce is a common trigger, but rocky relationships with friends and family can trigger depression, too. Trauma. Physical or sexual assault, natural disasters, involvement in a car accident and other traumatic events can cause symptoms of major depressive disorder. Stress. The stress of losing a job, managing a high-pressure job, or dealing with a physical health issue can all cause depression. Isolation. Insufficient human contact can also cause depressive disorders. Addictive Behaviors. Although depression often exists before the onset of addictive behaviors, alcohol abuse, gambling and even social media can also trigger depressive symptoms. The two most common treatments for depression are psychotherapy, led by cognitive behavioral therapy, and antidepressant medication. Cognitive behavioral therapy (CBT) helps clients challenge negative thoughts and develop personal coping mechanisms to manage stress. Medication can calm overactive neurotransmitters. Most health providers recommend a combination of CBT and antidepressants, depending on a client’s unique history, type of depression and reaction to medication. Depressive disorders and drug addiction are often intertwined. A study by the University of Utah recently showed that 1 in 3 Americans who suffer from depression also report problems with drug addiction. A mental disorder alongside drug addiction is called a dual diagnosis, or co-occurring disorder. A dual diagnosis requires personalized, dedicated treatment that provides clients with the tools to manage their mental illness separately from their addiction. At Sprout, we work with wellness centers that specialize in dual diagnosis treatment, with the resources and expertise to help individuals navigate treatment that leads to lifelong recovery. Do you or someone you know suffer from both depression and addictive behavior? We can help. Call us to find a recovery center near you that specializes in dual diagnosis treatment.